The minority lawmakers are planning to take their protests to President of the Senate, Senator Bukola Saraki, who has not removed Uba since his defection on February 21, 2017. The PDP caucus will be demanding that Uba be sacked and a member of the opposition be appointed as his replacement by Saraki. The committee, which exists in the Senate and House of Representatives, is the only committee in the National Assembly recognised by the Constitution and is traditionally headed by a member of the opposition. The duties of the committee include to monitor transparency and accountability in the management and expenditure of public funds by ministries, department and agencies. 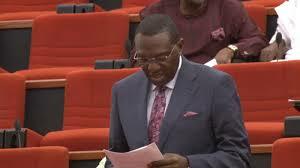 Uba had on February 21, 2017, formally announced his defection from the PDP to the All Progressives Congress on the floor of the Senate chamber. The PDP caucus, immediately after the announcement, demanded that Uba be removed as chairman of the committee the next day. Three months after, Uba is still the Chairman of the PAC, a situation that is not going down well with the PDP lawmakers. A member of the PDP caucus, in a chat with our correspondent, criticised Uba’s retention of the seat after his defection. He said the PDP senators had held meetings where the issue was discussed. The source hinted that another caucus meeting would be held on Tuesday where the PAC chairmanship would be discussed again.